In stock -This product will ship today if ordered within the next 2 hours and 18 minutes. The energi - Max Strength Iron & D3 is a dietary liquid tonic providing the optimum daily levels of organic form iron from ferrous gluconate, one of the most absorbable forms and bioactive form vitamin D3 in one natural orange flavoured spoonful. 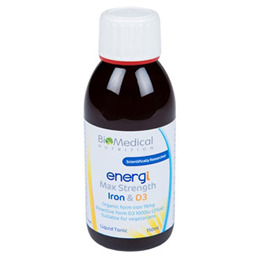 Iron contributes to the reduction of tiredness and fatigue, to normal energy-yielding metabolism, to normal red blood cell and haemoglobin formation which is supported by vitamins B6 and B12. Vitamin C increases iron absorption. Vitamin D3 contributes to the maintenance of normal bones and teeth, normal absorption and utilisation of calcium and phosphorous, normal muscle function, normal blood calcium levels, normal function of the immune system and the process of cell division. Folic acid contributes to normal immune system function, and to normal cell division. Formerly known as BioMedical Laboratories, BioMedical Nutrition has grown rapidly and is now a successful national and international enterprise. They supply a range of health food supplements and licensed herbal medicines, together with a range of premium beauty products to customers all around the world. Purified Water, Fructose, Natural Orange Flavour, Citric Acid, Carboxymethyl Cellulose, Potassium Sorbate. Children 4 to 12 years: 1 x 2.5ml spoonful daily. Over 12 years & adults: 1 x 5ml spoonful daily. Shake well before use. Use within two months after opening bottle. Food supplements must not replace a varied and balanced diet. Place out of reach of children. Below are reviews of energi - Max Strength Iron & D3 - 150ml by bodykind customers. If you have tried this product we'd love to hear what you think so please leave a review.